According to the World Health Organization, drug utilization evaluation (DUE), sometimes referred to as drug utilization review (DUR), comprised of continuous, systematic, criteria-based drug assessment to ensure the appropriate use of drugs. It provides formal, structured and continuing review of prescribing pattern, pharmacist dispensing, and medication administration and use by patient. DUE may be performed in prospective, concurrent or retrospective manner. Such studies not only ensure and influence appropriate medication decision making but also improve patient outcomes [1,2]. DUE is a necessary element for periodic examination of drug misuse or unnecessary consumption of medical care and implementation of appropriate actions where required. Like other countries, irrational usage is a common problem attributed by unsafe treatment associated with increased adverse drug reactions and the rapid spread of antibiotic resistant in the community so must be concisely control [3-5]. DUE measures the quality care and sustainability of drug therapy by determining drug usage data in health management. Such analyses are generally conducted to improve the clinical outcomes, prevent misuse of antibiotics, guideline compliance towards medical standards and to avoid drug-drug interactions . Rational utilization guide usually refers to selection of accurate medications, satisfactory dose, extent and effective management. Appropriate drug consumption helps health care practitioners in improving their routine treatment practice . Antibiotics are widely prescribed by the health care professionals in emergency room and about 85 % of these prescriptions are generated by general practitioners. Among different antimicrobial agents, antibiotics are considered as most commonly used and misused among other drugs [8,9]. Various studies have been conducted to explore provision of educational information to manage antibiotic usage. In acute hospitalization, about 20-30 % patients received antibiotics every day. European surveillance of antimicrobial consumption showed 18.53 % share of parenteral gentamicin . A study of hospitalized patients in Ethiopia accounted 25.6 % usage of gentamicin for pneumonia and acute gastroenteritis . Amikacin was first introduced as a broad spectrum aminoglycoside in 1981 to treat various infections caused by Gram-negative bacteria such as septicemia, meningitis, endocarditis, pneumonia and tuberculosis. Drug-induced hepatotoxicity is not usually reported and liver injury was found to be of very rare occurrence. Other common adverse effects included hypersensitivity reactions, nausea/vomiting, vertigo and headache . Poor usage of amikacin may cause harmful effects; the results of a trial indicated only 48 % of patients treated with amikacin were exactly followed treatment guidelines . However, according to a survey, most of the critically ill patients in intensive care unit (ICU) and burns unit of a hospital acknowledged 53.3 % of amikacin drug utilization . Ciprofloxacin, a fluoroquinolone was approved in 1987 to treat a variety of systemic infections. It is effective against lower respiratory tract infections, serious gastrointestinal (GI) infections, soft tissues and bone infections and typhoid . Ciprofloxacin found to be the treatment of first choice (42 %) for urinary tract infections (UTI) in 2005 as compared to (0 %) in 2007 by another trial. The clinical audit must be carried out to evaluate the accuracy of antibiotic consumption according to national guidelines . In contrast, an appropriate DUE of ceftriaxone was higher (65.5 %) in Korean University hospitals for liver toxicity, GI complications and neuropathy . A few cases of ciprofloxacin-induced photosensitivity, hypersensitivity, anaphylaxis, vasculitis and erythema multiform were documented . Previous studies in Nepal and a Canadian province suggested fluoroquinolone as most widely prescribed group of antibacterials over a period of 3 y . A study documented appropriate use of ciprofloxacin against clinical indication among 95 % of patients . Similarly the trend of intravenous ciprofloxacin was higher (67.6 %) in SaudiArabia . In many instances, therapy was initiated with parenteral ciprofloxacin but later switched over to oral fluoroquinolones, one such study declared 26 % of parenteral administration of fluoroquinolones . In an American study, fluoroquinolones were most commonly used by the specialties of family practice, internal medicine and urology. Another research study reported the highest utilization of ciprofloxacin in UTI, acute gastroenteritis and chronic obstructive pulmonary disease . A decline in unjustified usage of ciprofloxacin has been reported from 31 to 13 %  and its regular consumption found (28.4 %) for UTI by a survey research . In comparison to least use of gentamicin, approximately 1/3 of antibiotic utilization consists of ciprofloxacin . Further study revealed that only 26 % of patients who received ciprofloxacin were consistent with the indications given in hospital formulary . Meropenem classified as wide ranged antibacterial drug of carbapenem family approved in 1994. It is well tolerated and has good CNS and GI tolerability. The most common adverse events reported for meropenem were diarrhoea, skin rash and nausea/ vomiting . In the US, therapeutic indications of meropenem recommended for skin infection, abdominal infections and meningitis where as other various states suggest its use for pneumonia, complicated UTI and community acquired pneumonia . Furthermore, the findings of a study conducted in Karachi showed drug resistance, increased medical cost and highest adverse reaction as chief consequences related to unnecessary utilization of meropenem in about 43 % of renal insufficient patients . Moreover, the clinical findings in Thailand indicated frequent misuse of meropenem (19.3 %) out of 111 prescriptions along with 39 prescriptions of missed dose adjustment and 12 prescriptions showed inaccurate dose regimen . As antibiotics are frequently recommended in various health care settings for management and treatment of a range of ailments from common to complex situations, irrational and needless utilization of such drugs remains the most prevalent problem in under developed and developing countries. Such practices included inadvertent and excessive exploitation of antibacterial agents, which unfortunately became the major reason for the emergence of drug resistance, the prime obstacle in clinical management of infectious diseases that demands various strategic tools to manage and overcome such problems. Present study is planned to assess the appropriateness of various intravenously administered antibiotics in a tertiary care in-patient setting in Karachi, Pakistan. The current study was carried out in a multifaceted tertiary care setting in Karachi with completely developed medical specialties. The qualitative, cross sectional DUE was performed prospectively by reviewing medical records of 250 patients admitted to various departments or units of tertiary care hospital between the periods of 1 January to 30 June 2016. Prior approval of the presented research work was obtained from Institutional Ethics Committee (0211016ATPHARM). A formal permission was obtained from the hospitals administration. Confidentiality of the record was sustained all the way through the period of the research. All the patient records like demographic, medical and disease profiles were kept fully confidential. Patients prescribed with selected antibiotics like intravenous ciprofloxacin, meropenem and amikacin and those who were admitted to various hospital units such as internal/community medicine, pediatrics, GI, emergency, specialized care unit, infectious disease, surgery, and some others units were qualified the inclusion criteria in the present study. Patients with incomplete medications and or records were excluded. Using the system of hospital information, the respective record numbers of each patient who received intravenous ciprofloxacin, meropenem and amikacin for the stated period were acquired. For calculation of sample size the guidance of the Joint Commission on the Accreditation of Health Care Organization standard were considered . An average approximation of 1000 cases was recognized with antibiotics on periodical quarterly base from participating hospital. Therefore, 25 % cases (n=250) of total population were selected in current investigation from various units. A semi structured data collection form designed, providing a mixed approach of open- and close-ended questions to obtain the required details of patients’ medical profiles for the continuation of research work in order to produce the data that can be analysed quantitatively for evaluation of drug utilization pattern of specific group of drugs. The questionnaire was pretested to conduct the data collection for better understanding and interpretation of appropriate findings of the relevant parameters of study. Data collection form included the demographic and diagnostic details of hospitalized patients, antibiotic utilization data from various healthcare units, estimation of dosing, frequency, interval, adequacy of antibiotic administration and treatment duration as well as the determination of clinical outcomes associated with therapy. The patient’s medical charts were retrieved and retrospectively analysed for extraction of relevant data. For assessment of demographic variables, gender, age, hospital stay, residing ward were taken into consideration. Whereas prescribing variables for ciprofloxacin, meropenem and amikacin were studied with respect to initial/final diagnoses, administered dose, duration of treatment, dosing interval, frequency of administration, microbial culture/sensitivity test and multiple therapeutic regimen. Outcome measures were composed of clinical outcome with respect to therapy success or failure. Selected prescriptions of ciprofloxacin, meropenem and amikacin were also classified into subsequent categories of prophylactic, specific, empiric with respect to their rationale for utilization. Appropriate and rationale use of antibiotic was assessed by considering the quality criteria presented by Gyssens et al. and the guidelines presented by American Hospital Formulary Systems for optimal antibiotic therapy. The subsequent taxonomy was applied such as suitability of prescription, inaptness attributable to objectionable dose, route and administration intervals, incongruity owing to the extent or ineffective drug inclusion, inappropriate indication and report of inadequate utilization. The required information was recorded in a pre-constructed data collection form by trained pharmacists. Validation of data collection format for accepted consistency and reliability was carried out by measuring the coefficient of spearman correlation and Cronbach’s α values (P=0.908 and α=0.899). In case of any query and unclear scenario during the data collection and interpretation phase, a panel of clinical pharmacist, physician and pharmacologist was conferred to reach the suitable consensus. Data was descriptively analysed using software SPSS (version, 20). Qualitative data was presented in term of frequency and percentages whereas quantitative expressions were calculated with mean and standard deviations. Furthermore, in this study, antibiotic rationalization odds ratios (ORs) were calculated using confidence intervals (CI) 95 % with a level of significance at P<0.05 level. In this regard, logistic model of regression was applied to observe the relationship among antibiotics and appropriate utilization. The current investigation was carried out to evaluate the utilization pattern of intravenous ciprofloxacin, meropenem and amikacin in various units of tertiary care setting in Karachi, Pakistan. These agents were selected due to the broad spectrum activity against multiple strains of pathogens and accounted for the consumption of a considerable fraction of most hospitals’ outlay with respect to these antibacterial agents. On the basis of preliminary evaluation a significantly high number of patients were identified with ciprofloxacin, meropenem and considerably low with amikacin therapies. Final cohort was composed of 250 patients with n=100 each for ciprofloxacin and meropenem receivers and n=50 for amikacin group. Literature was evaluated to retrieve the DUE studies of selected drugs, but very small amount of such studies were reported by other investigators. Details related to the demographic variables like age, gender of patients and antibiotics distribution and utilization amongst diverse hospital units/ward were summarized in Table 1. Mean age of study respondents were in order of 36.64±17.16, 42.88±16.89 and 33.46±18.45 for ciprofloxacin, meropenem and amikacin, respectively. Whereas, higher usage of ciprofloxacin was observed in gastroenterology department (25 %), while meropenem and amikacin were substantially prescribed for specialized care unit (27 %) and pediatrics ward (28 %), respectively. During the study appropriateness of intravenous (IV) ciprofloxacin, meropenem and amikacin therapies in patient’s cohorts were estimated and presented in Table 2. Amendments in diagnostic profiles for respective drugs in selected patient’s cohort were also noted and mentioned in Table 3. Similarly antibiotics administered before, concurrent and after ciprofloxacin, meropenem and amikacin therapies were observed to determine the polypharmacy practices and appropriateness of prescriptions (Table 4). Frequency of prescriptions with respect to sole antibiotic or combination was also evaluated (Figure 1). Average clinical outcomes of ciprofloxacin, meropenem and amikacin were calculated as therapeutic success or failure indicator (Table 5, Figure 2). Statistical presentation of drug utilization data with respect to OR has also been elucidated with respect to reasons of inappropriateness in therapy (Figure 3) and appropriateness of treatment in specific groups of antibiotics (Table 6). 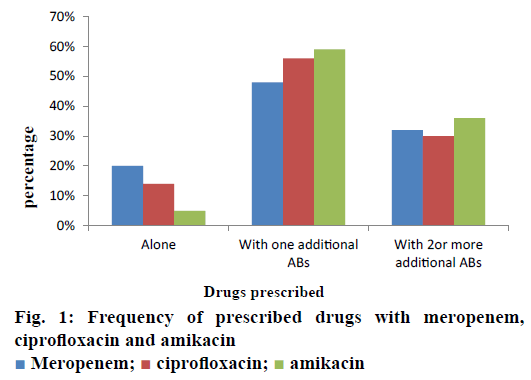 Whereas, utilization pattern of ciprofloxacin, meropenem and amikacin on the basis of indication and prophylactic, empiric and specific use was also determined in current investigation (Figure 4). 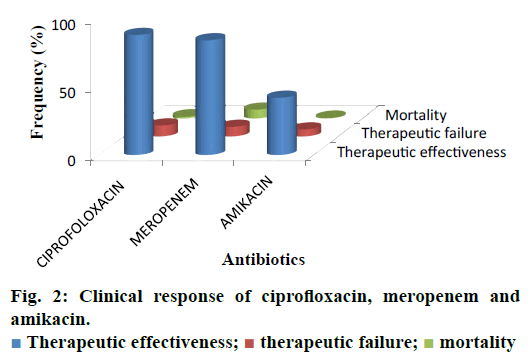 Figure 2: Clinical response of ciprofloxacin, meropenem and amikacin. Irrational, over and misuse of antibiotics arises as global concern in recent days in both hospital and community settings and lead to adverse events including antimicrobial resistance, associated health problems, amplified hospitalization stay and cost . In developing countries where antibiotic-management systems hardly exist, contrasting situations become more complex, which provide the undeniable evidence of the need for more rational use of antibiotics [32,33]. Prescribing practices are the main manifestation of health care professional abilities to assess best drug option for patients. Similarly, prescribing pattern is a component of medical appraisal, seek monitoring and recommend modifications in prescribing trend to make it rational and effective . One of the most important points in health care systems is to evaluate the appropriateness of medication use. Hence, DUE or DUR studies are designed to evaluate and improve the prescribing, administration and the rational use of medications . Current study exposed that maximum number of patients were prescribed an antibiotic at the time of admission. On the whole, 250 medical records were reviewed containing three antibiotics exclusively, ciprofloxacin, meropenem and amikacin administered IV. Though, few medical records were not appropriately detailed to present adequate information for the estimation of the actual pattern of the antibiotics utilization and respective quality valuation. However, higher OR values were observed with incorrect dose i.e., 0.562 (0.343-0.921), followed by inappropriate drug interval 0.428 (0.257-0.713). While lowest values of OR were observed with inapt therapies 0.149 (0.078-0.284) and inadequate spectrum levels 0.219 (0.122-0.392) at 95 % confidence interval (CI; Table 6). Estimation of appropriateness of such treatments in patient’s cohorts described the same diagnosis supported by various evaluations. Amongst the various antimicrobial cohorts, meropenem and ciprofloxacin were utilized in least inappropriate manner (OR; 0.136 (0.070-0.264); 0.149 (0.078- 0.284); Table 6). Furthermore frequency of antibiotic prescription along with single or multiple units was also determined and presented in Figure 1. One of the retrospective studies indicated 22 prescriptions of ciprofloxacin in patients who underwent surgery  in contrast to 12 prescriptions in this study. According to another trial, meropenem prescribed 22 % in ICU patients and in 35 % cases of pneumonia . Such results were almost similar to those of this study given in Table 1 for meropenem. Another study reported that combination therapy of meropenem with levofloxacin gave considerable better resistance suppression than did either monotherapy particularly in ventilatorassociated pneumonia . Although the principles of antibiotic prescriptions have been well-established internationally for many years but inappropriate use is still common particularly in developing countries . Several investigations revealed remarkable differences in the patterns of unsuitable prescribing, wrong choice, and improper use of antibiotics in different hospital units [40,41]. 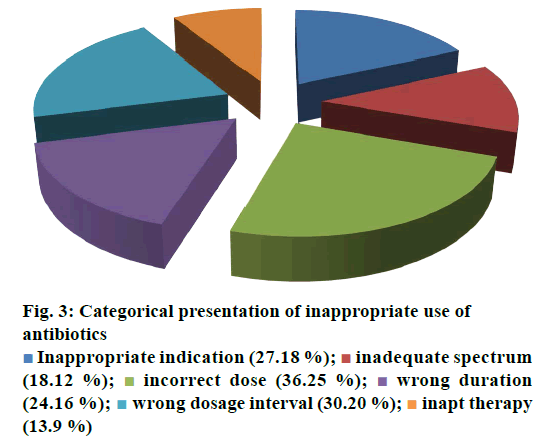 In the present investigation, inappropriate prescriptions of antibiotics were 27.18 % against the indication, wrong duration 24.16 and 18.12 % inadequate spectrum were the frequent errors. However, these findings reported high among hospitalized patients and need crucial focus on health management. Furthermore, clinical response of meropenem might lead to mortality compared to the use of ciprofloxacin and amikacin mention in Figure 2. A research showed that though meropenem was well tolerated by offspring, adults and has a satisfactory safety report, meropenem dosing strategies and optimization of outcomes were under examination . Non-randomized studies suggested that combination antibiotic treatment might present a relative advantage over monotherapy in view of mortality of seriously ill patients . Mohr investigated the range of hospital stay with meropenem from 3 to 14 d . Furthermore, various researchers proved that effective combination of ciprofloxacin with metronidazole and meropenem itself found to decrease the length of hospitalization and treatment duration for complicated abdominal infections [42-44]. The results of our study underline numerous areas that necessitate upgrading. Most importantly, there is a need to devise stern antibiotic restriction strategy and apply protocols for antibiotic usage in order to rationalize the prudent use of these drugs. Studies have revealed that the implementation of judicious antibiotic principles have had a noteworthy optimistic economic advantage and superior quality of care delivered to patients. Baseline data on the incidence of antibiotic use considered as the first step in encouraging drug monitoring and quality improvement. Next step need to evaluate adherence of prescribing health care providers towards clinical criteria for specific diagnosis. The present study showed therapeutic effectiveness of parenteral administration of ciprofloxacin and meropenem in majority of cases as compared to amikacin. But in contrast to ciprofloxacin, mortality rate was greater with meropenem. So quality of life can be enhanced by considering the standards of medical treatment at all levels of the health care system in order to improve health outcomes and to minimize the death rate. There is a substantial capacity for improvement in the DUE model. These findings suggest the need for implementing antimicrobial treatment guidelines. An antimicrobial stewardship program would offer the most comprehensive key for correct use of antimicrobials. Furthermore with the increasing interest in patient safety with respect to disease management and cost of care, factual estimates of drug utilization are of growing importance. It is essential to take action to recover drug utilization practice in order to minimize unnecessary usage of antibiotic thus augment the rational use. Cheekavolu C, Pathapati RM, Babasaheb Laxmansingh K, Saginela SK, Makineedi VP, et al. Evaluation of Drug Utilization Patterns during Initial Treatment in the Emergency Room: A Retroprospective Pharmacoepidemiological Study. ISRN Pharmacol 2011;2011:261-585. David A, Joyce FDR, Edwin CH, Roger W, Linda LS, Amanda BS. Drug Utilization Evaluation Identifies Costs Associated with High Use of Beta-Adrenergic Agonists. Ann Allergy Asthma Immunol 1996;76:153-8. Pavani V, Mihir YP, Shravani K, Prabhakar RV. Study of prescribing pattern for evaluation of rational drug therapy in Warangal. IJOPP 2011;4:77-9. Cheraghali AM, Nikfar S, Behmanesh Y, Rahimi V, Habibipour F, Tirdad R, et al. Evaluation of availability, accessibility and prescribing pattern of medicines in the Islamic Republic of Iran. East Mediterr Health J 2004;10:406-15. Gholamreza-Sepehri, Meimandi MS. The quality of prescribing in general practice in Kerman, Iran. Int J Health Care Qual Assur Inc Leaders Health Serv 2005;18:353-60. Ahmed MN, Muyot MM, Begum S, Smith P, Little C, Windemuller FJ. Antibiotic Prescription Pattern for Viral Respiratory Illness in Emergency Room and Ambulatory Care Settings. Clin Pediatr (Phila) 2010;49:542-47. Molstad S, Ekedahl A, Hovelius B, Thomansson H. Antibiotics prescription in primary care: a 5-year follow-up of an educational program. Fam Pract 1994;11:282-86. Coenen S, Muller A, Adriaenssens N, Vankerckhoven V, Hendrickx E, Goossens H. European Surveillance of Antimicrobial Consumption (ESAC): outpatient parenteral antibiotic treatment in Europe. J Antimicrob Chemother 2009;64:200-5. Feleke M, Yenet W, Lenjisa JL. Prescribing pattern of antibiotics in pediatric wards of Bishoftu Hospital, East Ethiopia. Int J Basic Clin Pharmacol 2013;2:718-22. Namazi S, Sagheb MM, Hashempour MM, Sadatsharifi A. Usage Pattern and Serum Level Measurement of Amikacin in the Internal Medicine Ward of the Largest Referral Hospital in the South of Iran: A Pharmacoepidemiological Study. Iran J Med Sci 2016;41:191-9. Yamoah AKK, Al-Homrany M, Bahar Y, Ahmed ME. Aminoglycoside usage and monitoring in a Saudi Arabian teaching hospital: a ten-year laboratory audit. J Clin Pharm Ther 2000;25:303-7. Meyerhoff A, Albrecht R, Meyer JM, Dionne P, Higgins K, Murphy D. US Food and Drug Administration Approval of Ciprofloxacin Hydrochloride for Management of Post exposure Inhalational Anthrax. Clin Infect Dis 2004;39:303-8. Raymond S, Bourdelin M, Becker M, Henon T, Patry I, Leroy J, Limat S. Antibiotics in elderly patients: Impact of clinical practice evaluation. Med Mal Infect. 2011;41:330-5. Lee H, Jung D, Yeom JS, Son JS, Jung SI, Kim YS, et al. Evaluation of Ceftriaxone Utilization at Multicenter Study. Korean J Intern Med 2009;24:374-80. Shilpashree HS, Sarapur S. Ciprofloxacin-induced erythema multiforme. J Pharmacol Pharmacother 2012;3:339-41. Linder JA, Huang ES, Steinman MA, Gonzales R, Stafford RS. Fluoroquinolone prescribing in the United States: 1995 to 2002. Am J Med 2005;118:259-68. Goldman MP. Ciprofloxacin drug utilization review and prospective drug use evaluation. DICP 1990;24:82-6. Pariente-Khayat A, Vauzelle-Kervroedan F, d'Athis P, Breart G, Gendrel D, Aujard Y, et al. Retrospective survey of fluoroquinolone use in children. Arch Pediatr 1998;5:484-8. Hammerman A, Greenberg A, Yinnon AM. Drug use evaluation of ciprofloxacin: impact of educational efforts on appropriateness of use. J Clin Pharm Ther 1997;22:415-20. Ramanath KV, Shafiya SB.Prescription pattern of antibiotic usage for urinary tract infection treated in a rural tertiary care hospital. IJOP 2011;4:57-63. Mousavi S, Behi M, Taghavi MR, Ahmadvand A, Ziaie S, Moradi M. Drug Utilization Evaluation of Imipenem and Intravenous Ciprofloxacin in a Teaching Hospital. Iran J Pharm Res 2013;12:161-7. Baldwin CM, Lyseng-Williamson KA, Keam SJ. Meropenem: a review of its use in the treatment of serious bacterial infections. Drugs 2008;68:803-38. Khan MU, Yousuf RI, Shoaib MH. Drug utilization evaluation of meropenem and correlation of side effects with renal status of patients in a teaching based hospital. Pak J Pharm Sci 2014;5:1503-8. Ayuthya SK, Matangkasombut OP, Sirinavin S, Malathum K, Sathapatayavongs B. Utilization of restricted antibiotics in a university hospital in Thailand. Southeast Asian J Trop Med Pub Health 2003;34:179-86. Gyssens IC, van den Broek PJ, Kullberg BJ, Hekster Y, Van der Meer JW. Optimizing antimicrobial therapy: a method for antimicrobial drug use evaluation. J Antimicrob Chemother 1992;30:724-7. Fridkin SK, Steward CD, Edwards JR, Pryor ER, McGowan JE Jr, Archibald LK, et al. Surveillance of antimicrobial use and antimicrobial resistance in United States hospitals: Project ICARE phase 2. Project Intensive Care Antimicrobial Resistance Epidemiology (ICARE) hospitals. Clin Infect Dis 1999;29:245-52. Bantar C, Sartori B, Vesco E, Heft C, Saúl M, Salamone F, et al. A hospital wide intervention program to optimize the quality of antibiotic use: impact on prescribing practice, antibiotic consumption, cost savings, and bacterial resistance. Clin Infect Dis 2003;37:180-6. Sabuda DM, Laupland K, Pitout J, Dalton B, Rabin H, Louie T, et al. Utilization of colistin for treatment of multidrug-resistant Pseudomonas aeruginosa. Can J Infect Dis Med Microbiol 2008;19:413-8. Patel MK,Barvaliya MJ,Patel TK,Tripathi C. Drug utilization pattern in critical care unit in a teaching hospital.Int J Crit Illn Inj Sci2013;3:250-5. Jayanthi MK, Sushma NV. Drug Utilization Pattern and Pharmacoeconomic Study in Pediatric Dentistry at a Tertiary Hospital. Int J Pharm Pharm Sci 2014;6:70-2. Khade A, Bashir M, Sheethal A. Prescription pattern in the department of surgery in a tribal district hospital of Andhra Pradesh, India. Ann Med Health Sci Res 2013;3:438-41. Salehifar E, Shiva A, Moshayedi M, Kashi TS, Chabra A. Drug use evaluation of Meropenem at a tertiary care university hospital: A report from Northern Iran. J Res Pharm Pract 2015;4:222-5. Louie A, Grasso C, Bahniuk N, Van Scoy B, Brown DL, Kulawy R, et al. The combination of meropenem and levofloxacin is synergistic with respect to both Pseudomonas aeruginosa kill rate and resistance suppression. Antimicrob Agents Chemother 2010;54:2646-54. Blomberg B. Antimicrobial resistance in developing countries. Tidsskr Nor Laegeforen 2008;128:2462-66. Vlahovic-Palcevski V, Francetic I, Palcevski G, Novak S, Abram M, Bergman U. Antimicrobial use at a university hospital: appropriate or misused? A qualitative study. Int J Clin Pharmacol Ther 2007;45:169-74. Pulcini C, Mondain V, Lieutier F, Mousnier A, Roger PM, Dellamonica P. Fluoroquinolone prescriptions in a teaching hospital: a prospective audit. Scand J Infect Dis 2007;39:1013-7. Mohr JF3rd. Update on the efficacy and tolerability of meropenem in serious bacterial infections, Clin Infect Dis 2008;47:41-51. Falagas ME, Lourida P, Poulikakos P, Rafailidis PI, Tansarli GS. Antibiotic Treatment of Infections Due to Carbapenem-Resistant Enterobacteriaceae: Systematic Evaluation of the Available Evidence. Antimicrobial Agents Chemother 2014;58:654-63. Kent AJ, Sketris IS, Johnston BL, Sommers RB. Effect of Utilization Policies for Fluoroquinolones: A Pilot Study in Nova Scotia Hospitals. Can J Hosp Pharm 2009;62:12-20.